Lucius T. Hill III has managed this bond fund since 2008. He is the Senior Vice President of Wellington Management Company, LLP. The fund’s expense ratio is 0.22% per year. This expense fee is lower than the average expense ratio of Long-Term Bond category which is 0.98%. Its total net assets are $ 13.58 billion. This best rated bond fund also has a dividend yield of 4.57%. VWESX fund has no management fee. It is also a no-load fund therefore it doesn’t charge any front-end sales load fee or deferred sales load fee. It has 443 numbers of bonds. 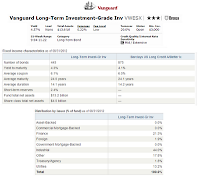 This long term bond mutual fund has 3-stars and Bronze rating from Morningstar. Since its inception, it has recorded 34 years with positive return and 4 years with negative return. The best 1-year total return was recorded in 2011 with 17.18%. The worst performance year occurred in 1999 with -6.23%. It has returned 7.72% over the past 10-yeara and 13.40% over the past one year. 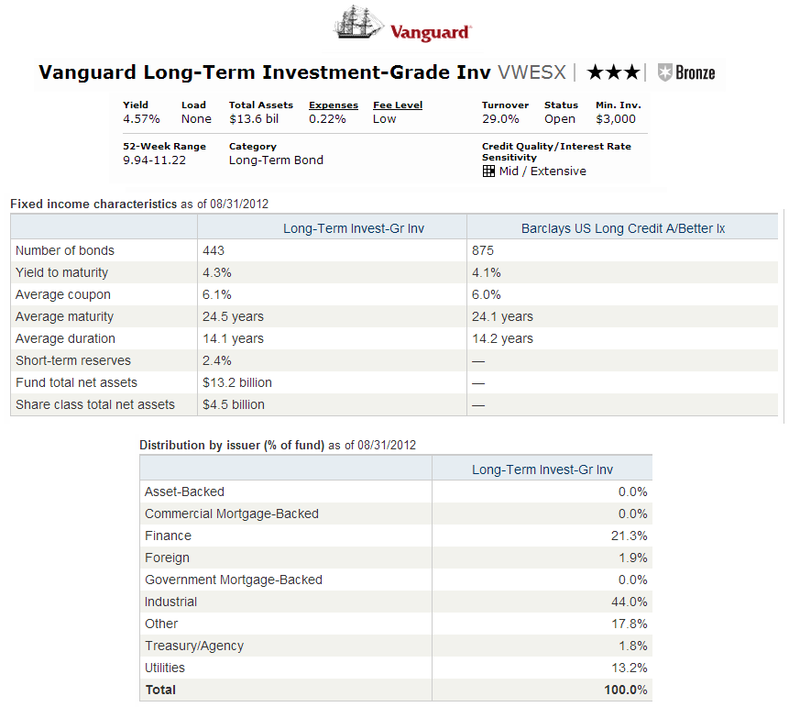 This fund is available in other class, which is Vanguard Long-Term Investment-Grade Fund Admiral Shares (VWETX). The fund’s benchmarks are Barclays US Long Credit A/ Better Bond Index and Barclays U.S. Aggregate Bond Index. There are around 88 brokerages which offer this Vanguard fund, such as E Trade Financial, T Rowe Price, Schwab Retail, Royal Alliance, Raymond James, Vanguard NTF, etc. You will need $3,000 minimum initial investment to invest in this fund in regular brokerage account. There is no retirement account available. The distribution by issuer as of August 2012 is Industrial (44.0%), Finance (21.3%), Other (17.8%), Utilities (13.2%), Foreign (1.9%) and Treasury/ Agency (1.8%). Investing in this mutual fund involves risks. The primary risks are interest rate risk, call risk, credit risk, management risk, etc.